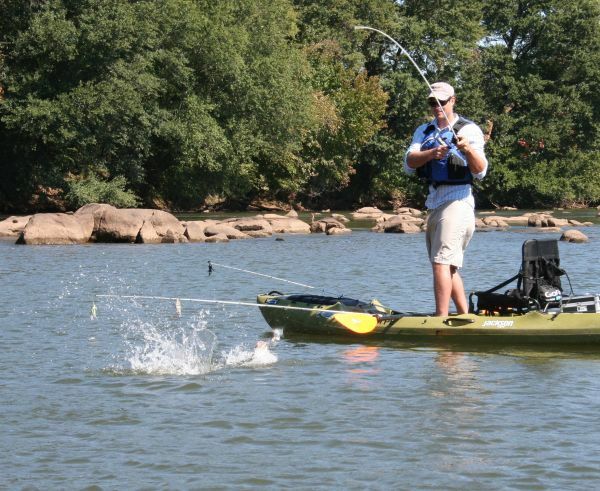 A kayak is the perfect watercraft for fishing the Catawba River, and now is a good time to drift this river in search of largemouth bass. One of the best kayak launches on the river is Rock Hill's Riverwalk Trail. This is a great place to start your fishing journey, or if you're looking for an all-day trip, launch at the base of the Lake Wylie Dam and drift done to the Riverwalk Trail. Either way, you'll have access to rocky shoals, deep holes, and downed timber along the shorelines. These are all key spots to target when bass fishing. This time of year, it's not uncommon to hit some pretty dry spots on the river that will require dragging your kayak over a few rocks. It's a little bit of work, but as kayak angler Drew Gregory puts it 'The conditions that force kayak anglers to do this sort of work are the same conditions that make the fishing so good, so it's always worth it.' Gregory has extensive experience fishing this river and fishes with buzzbaits and spinnerbaits all day long.